It's Just Mobolaji | Music & Entertainment: Event: ‘Because We Can’, November 30th! 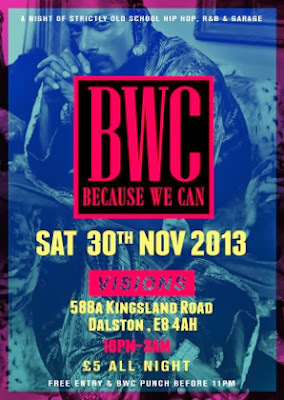 Event: ‘Because We Can’, November 30th! Club nights in London are always a hit! And now they've added Because We Can to the selection of club nights. On the last Saturday of every month, the BWC crew will come together to host a night of non-stop raving - playing the best in old skool hip-hop, garage and R&B in Dalston. Because We Can is just the place to be this Saturday (30 November), peep below for more details. Tickets: £5 all night and FREE before 11pm! Make sure you roll down to Because We Can for good vibes and banging tunes! Not to be missed!